If you find yourself wondering how the large man riding past you in the tiny yellow shorts can stay up on something as skinny as a bicycle, be heartened by the fact that scientists wonder too. Though they have long known how fast the earth is traveling around the sun, and what deep ocean currents do, and how to get to the moon, the way that different forces combine to produce bike-stability is still a subject of investigation. Many have agreed that bikes are held up at least partly by two powerful gyroscopes – their wheels. A gyroscope is, appropriately, a spinning wheel or a sphere that rotates so fast, it creates forces that make it hard to change its orientation. Scientists, fittingly, use gyroscopes to measure changes in orientation. As a bike wheel spins, it is rotating around an imaginary horizontal line that goes through its center, creating a force in the direction of its spin. If you try to change the horizontal axis by falling left or right, the spin translates that push into a turning motion. Lean right – turn right, lean left – turn left. Scientists call this behavior precession. You can see precession in action with a rider-less bike. Take your two-wheels out to the park and give it a good forward shove. Then, run up alongside and give it a sideways shove. Unless you’re doing a full on rugby tackle, the bike should wobble, but then realign and keep on going. Scientists believe that it’s the forward spinning motion of the wheels that helps to keep the bike balanced. On the other hand, it has also been shown that the gyroscopic effect of a bicycle’s wheel is all but cancelled out by the weight of the rider’s body as well as the force pushing down on the front handlebars. One ambitious engineer, Dr. Hugh Hunt of the University of Cambridge, built a bike with a second front wheel. Theoretically, if gyroscopes were all that had to do with balance, spinning the second wheel in the opposite direction of the first would cancel out the gyroscopic forces, and make the bike un-rideable. Yet no matter how fast the second wheel was spun, the bike performed exactly the same. This, he concluded, demonstrated that while gyroscopes are part of a bicycle’s movement, their effect on stability is small enough that it is overshadowed by the force of the rider’s weight and movement. This leaves a bicyclist to depend on small corrections in her steering, body position, and speed to keep her from falling. You can see such corrections at work when watching a beginner zoom around. New cyclists tend to veer back and forth, correcting any leaning with big shifts in direction. Sneakily, experienced riders are doing this, too – just so precisely that you can’t really tell. This acute adjustment of balance also explains those hipsters in really tight pants doing ‘track stands,’ or staying still on a bike without putting a foot down, at city intersections. Inexperienced track-standers wobble back and forth, slowly inching into oncoming traffic; the well practiced, on the other hand, shift their weight so precisely, the bike stays put. This represents the kind of physical power over the bicycle that Hunt says overshadows the spinning of the front wheel. The caveat to the balance-shifting explanation is that it only represents the forces responsible for keeping you upright when you’re riding fast in a straight line, or refusing to put foot to asphalt at a stoplight. Gyroscopic action becomes extremely important for maintaining a straight path when you ride “no-hands” and you aren’t using your arm-force to steer. True to this point, researchers at the Delft University of Technology in the Netherlands built a spider-shaped test bike with a computer on the back that precisely measures forces while rolling on a giant treadmill. Their results suggest that a rider’s skill at balancing and the shape of his bike prevent him from falling over as he rides. Gyroscopic forces help keep him from falling over if you give him an overzealous pat on the shoulder. So go on – give Mr. Yellow-shorts a little push. He’ll be fine. as a committed tight pants hipster for almost fifty years, i have believe thet the trousers have at least a little to do with it as well. less drag! F = ma ……a good piece. Pretty great post. I simply stumbled upon your blog and wanted to say that I’ve really enjoyed browsing your weblog posts. In any case I will be subscribing on your feed and I am hoping you write once more very soon! 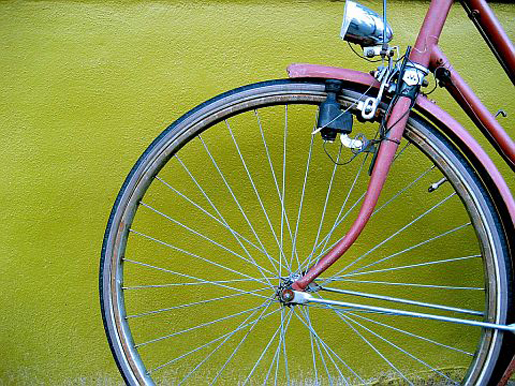 The bicycle tends to stay upright because the camber force pushes the bike in the direction it leans and the reduced lateral stiffness at the front causes the bike to steer into a fall. It’s simple obvious engineering but outside the understanding of science. The gyroscopic forces may cancel out the effect of precession on the balance, but you have additional forces at play. First – there is a center of gravity to the object, and since bicycles are generally bilaterally similar you can hypothetically balance one even at a standstill. Second – Adding a counter spinning gyro doesn’t really cancel out the centripetal energy of the first. It may negate the stabilizing effect with respect to the axis of rotation, but the force is still being extended outward from the point of origin. While there is a direction to the gyro’s spin, the centripetal force extends outward, and outward only. Third – Wheels work well because they make it easier to overcome the frictional coefficient of the surface they travel over in a linear direction. That’s one of the reasons why bicyclists don’t replace them square blocks of rubber, or try to ride by sliding the wheel sideways. As long as there is sufficient force (momentum) that causes it to be more efficient for the wheel to fall in it’s linear direction the bicycle stays upright. Once the frictional coefficient is greater, the fall will become perpendicular to the surface (“down”), at which point variations in the bicycles distribution of mass with respect to its center of gravity will cause it to topple over. Hypothetically a bicycle could on its own – roll to a stop and stand upright if it happened to be equally balanced about its center-line, and other forces such as wind did not shift this. Comment 4 above by Calvin Hulburt deserves a rebuttal. If tire forces are responsible, where is the proof? If the Whipple model is so wrong, why does it keep generating predictions that are then proven correct by physical experimentation? First the weave frequency of a traditional bicycle, and then the self-stability of the two-mass skate bicycle. There is one prediction from the current theory that tire forces are responsible, and that is that the net ground reaction forces align with the midplane of a bicycle as it leans. This can easily be shown, however, to be based on an oversimplification. It is only true if the bicycle is modeled as a point mass on a massless rod. As soon as the model accounts for a more-realistic mass distribution, the net ground reaction forces do not align with the midplane of the bicycle as it leans, and can then generated the steering torque necessary for self-stability via trail in a traditional bicycle. Posted on December 17, 2012 at 8:46 amHey this is somewhat of off topic but I was wondering if blogs use WYSIWYG editors or if you have to manually code with HTML. I’m starting a blog soon but have no coding know-how so I wanted to get advice from someone with experience. Any help would be greatly apretciaped!